Climate change is one of the greatest and most urgent issues currently facing humanity, but attempts to craft a sufficient response have been frustratingly difficult. Some have described climate change as a “Wicked Problem” – a problem so complicated, interconnected, and psychologically difficult to face that it becomes fiendishly hard to find good solutions. Difficult-to-forecast Climate Tipping Points such as changes in ocean currents, rapid arctic warming, and social cascade effects like the refugee crisis also make the urgency and impacts of climate change more difficult to predict and comprehend. 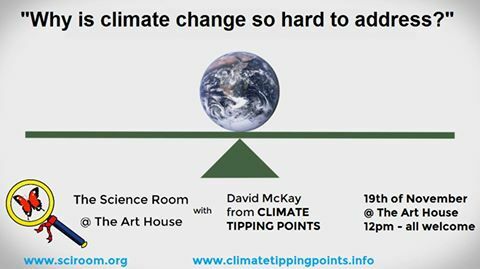 In this Science Room, David will discuss why Climate Change is such a Wicked Problem, the role of Tipping Points, and how these issues might affect our responses to Climate Change. A donation to The Art House is highly encouraged but not compulsory for attending the event. Join us in The Art House on Above Bar Street for a good coffee and great, wicked science!